As a company of radon mitigation experts, Clean Air Act, Inc. is committed to educating our customers about the connection between lung cancer and radon gas. It's important to note that radon levels can be reduced to safe levels. We want to help you make that happen! As certified members of the National Radon Defense network of radon mitigation experts, Clean Air Act, Inc. provides homeowners throughout Oregon with customized solutions for achieving safer levels of radon within residential buildings. Contact us today for more information about radon testing and our radon reduction services. Regular testing will help limit the risk of dangerous exposure to radon in your home. Lung cancer is responsible for killing more Americans annually than the other top cancers combined. And because it's often considered a "self-induced" disease, it also tends to be the least funded. However, the World Health Organization reports that radon causes 15% of the world's lung cancer cases, leading to the deaths of 20,000 Americans annually. For those 20,000 people who do not have lung cancer due to tobacco smoke, this is far from self-induced! That radon gas was actually a vital aspect of the gaseous makeup of the nuclear bomb? The bombs utilized uranium and became known for the residual effects of radiation poisoning. Although the levels of radon that resulted from the nuclear bombs far exceed the amounts of radon found in a home, the principle remains the same -- exposure to radon gas is very harmful and can be deadly! 1 pCi/L of radon is equal to 2.5 cigarettes a day! Multiply a home's radon levels by 2.5 and understand that any homeowner could easily experience the effects of smoking a "pack a day" if the radon levels are at 4.0 pCi/L-- the minimum action level established by the Environmental Protection Agency. The amount of radiation in 4.0 pCi/L of radon is actually equivalent to the radiation in 100 chest X-rays. Sure that seems like a lot, but this gets worse. Most hospitals actually only allow patients to have four chest X-rays each year. If you don't know what your home's radon levels are, it's important to have the space tested right away. Radon gas is odorless, tasteless in water, and invisible. Levels can vary from one home to the next, so even if your neighbor has safe levels, your health may be in danger. If testing shows that your home's radon levels are indeed higher than the recommended safe level (4 pCi/L), you should consider installing a radon mitigation system. Here at Clean Air Act, Inc., our experts offer free quotes for a customized system, so there's no risk in learning more. If your budget is limited but you'd like your home environment to be healthy as soon as possible, be sure to ask us about our financing options. Contact us by phone or e-mail today for a cost quote for radon testing or a mitigation system quote! 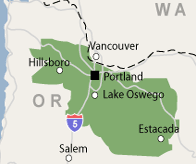 We proudly serve the Oregon area, including Beaverton, Gresham, Portland, Oregon City, Hillsboro and surrounding regions including Woodburn, Lake Oswego, Tualatin, Clackamas, West Linn.